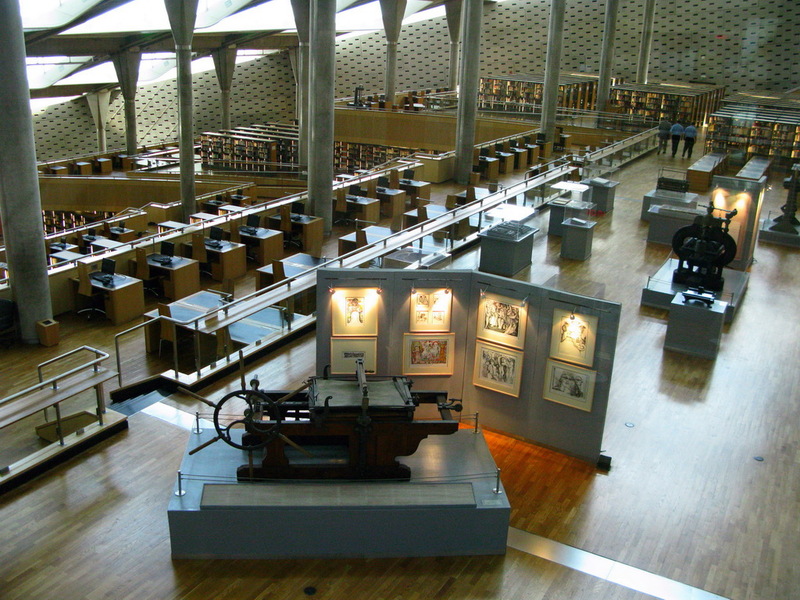 The Digital Library in the Ashes of Alexandria: What Good is a Universal Library? For a course in Digital Libraries with Professor Richard Arias-Hernandez, on 6 November 2014, I submitted an essay about the dream of a universal library: a collection containing one copy of each work. Source: Vicky Charitopoulou at flic.kr/p/7mEVg5, of the current Library of Alexandria. Some of the more optimistic among us have dreamt of a universal library, variously imagined as a collection of all human knowledge or a collection of all human works. The earliest library to have such an aspiration was the Library of Alexandra—or, anyway, the library Alexandria is imagined to have had—but the dream has recurred throughout history, famously in Vannevar Bush’s memex and H. G. Well’s World Brain. More recently, the Internet and digital libraries have made this dream seem possible again. Yet it is almost certainly no more than a dream; as many have argued, such a library would be impossible to create, impossible to maintain, and even more impossible to use. Even if it were possible, it might not be desirable; building and maintaining that library might violate rights to intellectual property, rights to privacy, and rights to cultural integrity. Despite these challenges, the dream itself might not be misguided, so long as it remains an aspiration in balance with other goals and principles. The idea of a universal library is not new. The Library of Alexandria’s reported ambition was to contain a copy of every work in existence and, given its manuscript culture, this often meant possessing the only copy of many works. However, this ambition may have been more legend than fact; according to Miroslav Kruk’s “The internet and the revival of the myth of the universal library,” there were two libraries in Alexandria, and the vast majority of their collection was in Greek rather than Egyptian or Hebrew (138). However, Kruk’s observation only indicates that the Alexandrian librarians did not succeed in their ambition, not that they had no such ambition. Meanwhile, David Oberhelman, in “Alexandria, the world brain, and the universal digital library: beyond the Google Books settlement,” observes that Alexandria may have seized manuscripts from passing ships (4): in Kruk’s formulation, “For some libraries to become universal, other libraries have to become ‘less universal’” (143). As print culture proliferated, the dream of holding a copy of all books in one library building dwindled—except in the work of magic realist authors like Jorge Luís Borges—but it survived in other forms. Oberhelman lists Vannevar Bush’s “memex,” which is a microfilm reader and indexing device which could potentially contain all knowledge in microfilm form, and H. G. Wells’ idea of the world brain, which invokes the global vision now common to the World Wide Web. And, indeed, the Internet has become the current repository for these dreams. Kruk, however, argues that the universal library is either impossible or undesirable; the dream is either utopia or nightmare. He distinguishes between the universal library and the perfect library: the universal library contains all authored works, while the perfect library contains all human knowledge (139). But both visions are problematic. The universal library would suffer from an enormous and endless collection explosion: not just printed works, but unprinted works, ephemera, and oral works must be collected. Unless humans simply stop creating new works, the library would endlessly grow. The perfect library would suffer from the need to perpetually weed, since human knowledge is not just expanding but improving, and old ideas are replaced by new ones. The library would always be changing. Or, if old knowledge was not replaced by new knowledge, the perfect library would contain incorrect ideas as well correct ones, in which valuable materials would “be defined as small islands of meaning surrounded by vast oceans of meaninglessness” (139), invoking Borges’s short story “The Library of Babel.” Kruk insists that a digital library would be no better, because the material carrier of the information changes none of its fundamental principles (145). The universal library is a bad idea: “such a library cannot exist, or if it existed, it would be chaotic and impossible to use” (ibid). But just as Kruk mistakenly interprets the Library of Alexandria’s omission of most Egyptian and Hebrew texts as a lack of universal ambition, so Kruk’s analysis pertains only to the final achievement of a universal library. In both cases Kruk only considers realizations of the ideal. Instead, a library— traditional, digital, or hybrid—may well take the universal library as an ideal by which it shapes its collection policy; instead of believing they can actually achieve a truly universal library, collections librarians, archivists, and curators might simply say that every book, or piece of human knowledge, is worth including in the collection by its own right, even if this cannot be achieved for one reason or another. This more modest, honest dream is likely worth more consideration than Kruk’s realized universal library is. Further, Kruk’s claim that the material carrier does not matter is not strictly true: in print collections, it might be true that for some traditional library to become universal, it must take books that other libraries could have had, but digital objects can be much more readily copied than physical ones, making universal libraries much more equitable—provided that copying those digital objects is legal and affordable. Copyright, according to Oberhelman and to Reid Goldsborough in “Toward a Universal Library,” might be the biggest barrier to the creation of universal digital libraries. Goldsborough writes, “Until a way is devised to compensate authors, do not expect the entire contents of current books to be freely available through any service” (50); perhaps ironically, the entire contents of current books are freely available in libraries’ print collections. Oberhelmen surveys Google Books’ attempt to digitize and make public many works with ambiguous copyright status and the 2011 rejection of an agreement that would allow them to do so. In the case of digital libraries, existing copyright law means that such libraries cannot provide access to copyrighted material without the copyright holders’ permission, and so copyright laws might well make the universal library entirely impossible. Neither Goldsborough nor Oberhelmen suggest that abolishing copyright might be a solution, but Oberhelmen, when discussing H. G. Wells’s world brain, does mention the connection between that idea and Wells’s socialist politics, where all knowledge is held in common. Certainly it seems that only one of the universal library and copyright is possible. Even if the copyright problem were overcome, other issues might still remain. For instance, should all works be publicly available? For instance, knowledge of certain indigenous practices is restricted to particular members of their community—those with certain training, for instance, or those of a certain gender (Christen). Making such knowledge publicly available to anyone at all would be a violation of those cultures’ values. A similar issue pertains to perfect libraries rather than universal ones: it would be a violation of privacy rights to release some human knowledge to the public. See, for instance, the controversy surrounding the genetic material of Henrietta Lacks, or the controversy surrounding the United States National Security Agency’s collection of citizen’s information, or the recently-arguments for the Right to Forget. Print collections cannot have a copy of book without preventing other libraries from having that same copy, but digital libraries cannot always legally offer the contents of a book in the way that print libraries can. Even were this double bind soluble, there could be other ethical concerns involving privacy and respect of minority cultural values. Given these problems, it is worth asking whether the universal library is worth dreaming about, even in the limited sense of an unattainable ideal guiding collection development policy. Christen, Kimberly. “Does Information Really Want to Be Free? : Indigenous Knowledge Systems and the Question of Openness.” International Journal of Communication, 6: 2012. 2870-2893. Goldsborough, Reid. “Toward a Universal Library.” Teacher Librarian, 35.3: 2008. 50. Kruk, Miroslav. “The Internet and the Revival of the Myth of the Universal Library.” The Australian Library Journal, 48.2: 1999. 137-147. Oberhelman, David D. “Alexandria, the world brain, and the universal digital library: beyond the Google Books settlement.” Reference Reviews, 25.8: 2011. 4. Prof. Arias-Hernandez suggested that I needed more citation and discussion for the Henrietta Lacks, NSA, and Right to Forget component, and he was of course correct. Typographic errors remain. This entry was tagged myth, science fiction. Bookmark the permalink.